You’ve heard of the famous Inchydoney beach. But did you know West Cork can claim to be the capital of whale-watching? It’s an early-morning start at the Inchydoney Island Lodge & Spa in West Cork as we make our way down, bleary-eyed, for breakfast at the hotel’s Gulfstream Restaurant. Overlooking the beautiful Blue Flag Inchydoney Beach, the menu is a dream for seafood lovers like me: smoked mackerel fillets, scrambled eggs with Ummera smoked salmon, and today’s local catch (sea bass) served with lemon, are all up for grabs. I tuck in to a slice of the hotel’s famous walnut brown bread (sweet and treacly with a delightful nutty crunch – an almost cake-like affair), as the sun shines over the Atlantic Ocean – it’s windy this morning and the sea is more than a little choppy. Washing down my hearty brekkie with the last of the fresh coffee, I’m feeling slightly nervous about our impending expedition. 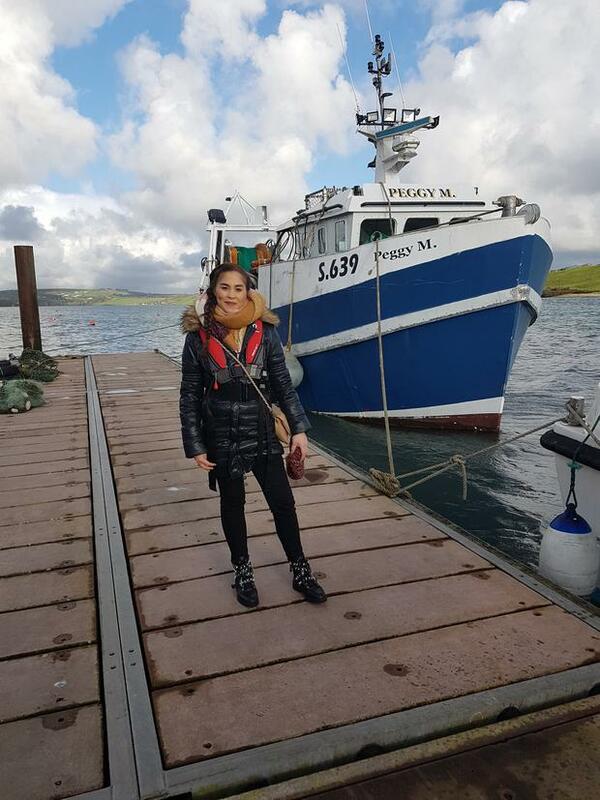 We take the scenic drive along the coast to the nearby town of Courtmacsherry, before checking in at the headquarters of the Atlantic Whale and Wildlife Tours. Our guide, Christopher O’Sullivan (who’s also a local Fianna Fáil councillor), talks passionately about the local marine animals that live and play around Inchydoney Bay. Cork is fast becoming the whale-watching capital of Ireland; the number of humpback whales in local waters have tripled to more than 100 in the last four years, and word of the world-class wildlife adventures available here is spreading quickly around the globe. Life jackets secured, we hop on a boat and brave the choppy sea waters, hoping to catch a glimpse of some of Inchydoney’s ocean giants, which include ‘Barnacle Bill’, the resident humpback whale. Sadly, conditions are too rough to go out far enough to see any wildlife, so we have to make do with a shorter tour. May to June, when conditions are warmest, is the best time to come for the wildlife tours, when almost every trip will guarantee a sighting of a dolphin. Sharks, seals and porpoises are also regularly visible, while September onwards is large whale watching season. Chilled to the bone after our boisterous sea adventure, the open fires in the lobby of Inchydoney Island Lodge are a welcome sight. The hotel is furnished in sandy beiges and pale-blue hues with woody textures… a colour palette that brings the seascape indoors for a fresh, beach-house feel. We make our way through to Dunes Bar for a big, warming bowl of steaming seafood chowder – chockfull of fresh fish, my companion described it as the best chowder she’d ever had. We mop it up with some buttery brown bread and, sufficiently heated up, make our way to the hotel’s Island Spa. Relaxation heaven is looking out at a blustery beach from Inchydoney’s heated seawater pool. Everyday, ocean water is pumped into the pool and warmed to an ideal temperature of 31 degrees – this heat encourages the skin’s pores to open so that the body can fully benefit from the salty water with all its healing nutrients. Dotted around the pool are a variety of powerful jet streams and luxurious bubble seats, as well as counter currents that offer a kind of underwater workout for the muscles. It’s like a therapeutic playground for stressed-out adults, and I swim my way around each station before making my way to a candlelit therapy room for a ‘Face & Body Indulgence’ treatment. This involves a toxin-busting, circulation-boosting, hot-stone body massage and a soothing anti-ageing facial (using renowned Elemis products), that leaves me ready for bed – even though the sun has yet to set over picturesque Inchydoney. Bear in mind that the thalassotherapy pool can get quite busy and noisy – if you fancy some adult or quiet time, I’d recommend going during the designated kid-free hours (12.30-3pm or after 5pm). We make our way to the Gulfstream Restaurant for an evening of fine-dining, on the way, admiring the paintings and sculptures from local artists showcased around the hotel (look out for the corridor of creepy clowns, eerily located beside the children’s playroom). Reflecting the surrounding coastline, the menu emphasises fresh seafood. 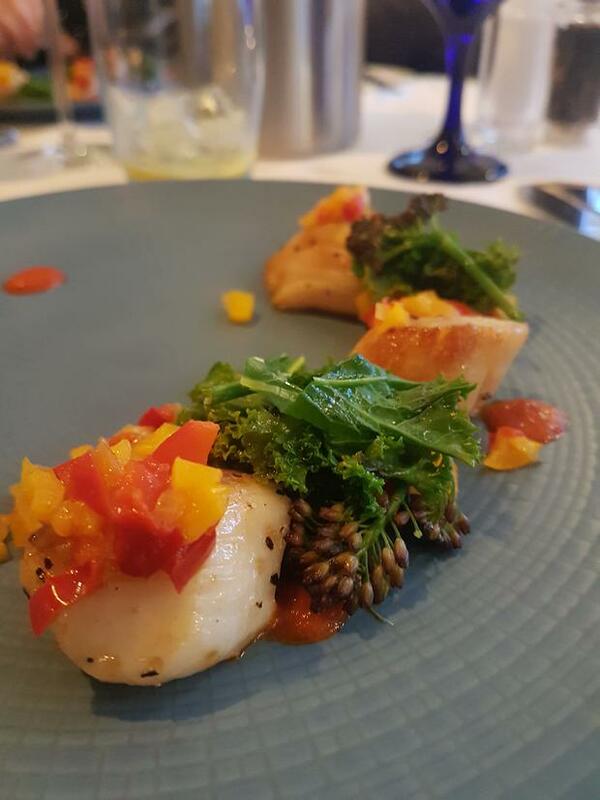 The style here is modern French/light Mediterranean cuisine, and I sample melt-in-your-mouth Seared West Cork Scallops with Garlic Roasted Broccoli to start, and an entree of meaty Pan-Fried Monkfish with Ratatouille. There’s always room for dessert, and on this occasion, that meant a rich, gooey Chocolate Toffee Fondant, served with candied apples and a scrumptious scoop of home-made salted-caramel walnut bread ice cream. It was the ice-cream flavour that sold it to me, and I wasn’t the only one won over by the winning walnut-bread: the next morning before check out, I witnessed several guests asking for a loaf to take home… and of course, the helpful staff happily obliged – a slice of Inchydoney to go. Gillian was a guest of Inchydoney Lodge & Spa, which is located just outside Clonakilty, is approximately 3.5 hours from Dublin. Rates start from €169pp for two night’s B&B, and whale watching trips can be added from €50pp (inchydoneyisland.com).